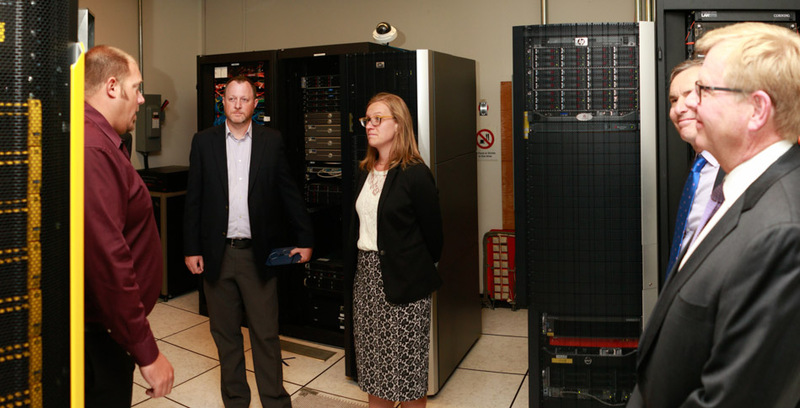 From left, Graig Kelly, infrastructure technology manager of the Faculty of Health Sciences Computer Services Unit, talks with Andrew McArthur, McMaster’s Cisco Chair in Bioinformatics; Karina Gould, MP and parliamentary secretary to the minister of international development; Marc LePage, president and CEO of Genome Canada, and Robin Harkness, vice-president, research of Ontario Genomics during a tour of the server room before the announcement. The government’s investment, totalling more than $4M, is the result of Genome Canada’s 2015 Bioinformatics and Computational Biology Competition, a partnership with the Canadian Institutes of Health Research (CIHR). Dr. McArthur, McMaster’s inaugural Cisco Research Chair in Bioinformatics, will work closely with researchers from the University of British Columbia, Simon Fraser University and Dalhousie University to design and develop novel software and database systems that will empower public health agencies and the agri-food sector to rapidly respond to threats posed by infectious disease outbreaks and food-borne illnesses. Spearheaded by Dr. McArthur and Dr. Gerry Wright, scientific director of the Michael G. DeGroote Institute for Infectious Disease Research (IIDR), CARD is a rigorously curated collection of data on antibiotics, targets and resistance determinants, providing researchers and clinicians with timely data, models and algorithms relating to the molecular basis of AMR.